Crossing the finish line in San Salvador in the Bahamas this morning just before 0600 UTC, Dona Bertarelli and Yann Guichard’s maxi trimaran Spindrift 2 has beaten the previous record for the Route of Discovery course, held since 2007 by Franck Cammas and his maxi trimaran Groupama 3 by more than 20 hours (20 hours, 29 minutes and 32 seconds). Spindrift 2 left Cadiz, Spain on 30 October at 15:19:34 UTC. 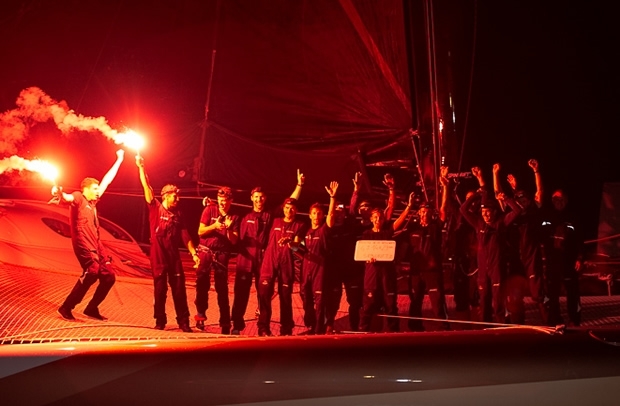 The crew of 14 on the world's largest racing trimaran now holds the record time for the 3,885 miles passage after setting a new time of 6 days, 14 hours, 29 minutes and 21 seconds at an average speed of 24.5 knots. Spindrift 2’s actual distance travelled was 4,503 nautical miles at an average of 28.41 knots. It is an achievement full of astonishing statistics with Spindrift 2 traveling 714.4 miles in one day last Friday, at an average speed of 29.7 knots. One burst of speed was recorded peaking at 46.08 knots. While the great white, black and gold bird is heading to Miami without a pit stop, and still enjoying a good breeze, Bertarelli and Guichard are celebrating with the crew this first beautiful page in the history of Spindrift 2, written without error and with great seriousness and professionalism. A tough last night: "Passing through the transition zone was marked by numerous storms, we entered without transition or virtually in strong north-east winds. We had 30 and 35 knots all night and the sea state got worse rapidly, with troughs of 5 to 6 metres and with short and crossed waves. It was like in the Mediterranean! It was pretty exhausting. The boat accelerated quickly down the waves and the helm was pretty stressful. We had to head west fast without putting too much strain on the equipment. We were racing against the clock and that times goes very quickly." Crossing the line: "It was a rare moment and a little strange because as San Salvador is a small island surrounded by beaches we had to approach very close to shore to distinguish the boat which had the official from the World Speed Sailing Record Council on board. It was a little stressful because of the proximity of the sandbanks. Then there was an eruption of joy on board...a beautiful moment." Record: "We made a good road, an effective path. I think this new record will be hard to beat. It was the result we planned for. That is a great satisfaction." Emotions: "This is huge. The emotion was waiting for us the moment we crossed the line. I enjoyed this race a lot; my first crossing of the Atlantic, in a race, for a record, with a good result at the end. Any doubts I might have had about this boat have gone. It is an extraordinary machine, and was combined with a great crew, following superb preparation made by the team on the ground and a sound choice of route; the excellent navigation work done by Erwan Israel, with Richard Silvani on shore." On a personal level: "Beyond the pleasure and satisfaction with the result, I think I have learned a lot about myself. I helmed in harsh conditions, especially last night in a really messy sea, and in 35 knots of wind. Yann was at my side because it got very physical. This boat has incredible power. The race is over. We return to Miami and I do not feel any fatigue. I am already thinking about the Jules Verne Trophy." About Yann Guichard: "I discovered even more about Yann the skipper, Yann the leader of men. His composure, serenity, calm in all circumstances are awesome. He is a very organised guy and he radiates self-confidence and pragmatism." The crew: "We brought together a mix of skills and a variety of diverse experiences: from the America's Cup to Figaro, inshore and offshore sailing and the marriage of those skills worked wonderfully." One woman and 13 men: "You will have to ask the crew about their feelings on having a woman on board. From my perspective, perhaps because I grew up in a masculine world and I have always sailed with boys, it did not cause me any particular problems. Very quickly, we all found we shared the same things. We learned little by little, to share everything, in a really friendly atmosphere." The clock: "We started in a good weather window. We knew from the start from Cadiz that there was a chance to achieve something great. We did this and did it well, with a great time. But it was not a foregone conclusion. We knew that the last third of the course would be complicated. We had lots of wind and sea on the Cadiz-Canaries stretch and also for the last 24 hours. But crossing the transition zone was a stressful time when squalls stalled us several times. We finished fast in harsh conditions for the men and the boat. This was the first crossing for Spindrift 2 and for Dona too. We are all happy and satisfied." The secret: "The recipe is simple: a good crew, a good weather window, a great route, closer to rhumb line, a great well-prepared machine and never letting yourselves be overwhelmed by the boat. It was very good living together, and it makes you want to go further with the men and the boat. " Thinking about Columbus: "This finish is charged with emotions. We thought a lot about Columbus approaching the islands. We tried to imagine these men arriving there after 30 days at sea. We felt great respect for them. This is also the magic of this record; the anchor in the history of great discoveries." Dona: "Dona is proud of a job well done. I felt it was happy and very comfortable with her on board. She helmed a lot and in very difficult conditions." - New passage time: 6 days, 14 hours, 29 minutes and 21 seconds (improvement on Groupama 3 time by 20 hours, 29 minutes and 32 seconds). - 24.5 knots average speed over the theoretical 3,885-mile course. - Total distance covered of 4,503 nautical miles at an average speed of 28.4 knots. - Highest number of miles covered over 24 hours: 714.4 miles on the 01/11/2013 at 1845 GMT. - Best average speed over 24 hours: 29.7 knots. - Highest recorded speed: 46,08 knots. - Spindrift 2 crossed the start line in Cadiz (Spain) on Wednesday, October 30 at 16 hours, 19 minutes and 34 seconds (local time). - Spindrift 2 crossed the finish line in San Salvador (Bahamas) on Wednesday 6 November 6 at 00h, 48 minutes and 55 seconds (local time).